So here's one of those times where I read a pattern, figure I don't need a gauge swatch, and start knitting away. It's just a scarf, right? Exact measurements aren't important. Except when your pattern takes exactly two skeins of yarn and that's all you have. I realized after I was a quarter of the way done that I was knitting just under a 3/4 of an inch for every inch I should be knitting. 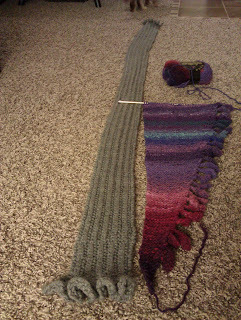 That doesn't seem like much, but that means I'm either knitting a very short scarf or I don't have nearly enough yarn. Since I don't want a super short scarf, I ordered two more skeins of yarn (although I should only need one more) and they arrived today. They're from a different dye lot but close enough that I don't think anyone will notice. One skein got me to almost a third of the length I want. So I've started on the second skein and I'm just over a third now, as you can see. At this rate it's going to be very fat in the middle. Hopefully with the super tight knitting I apparently do it will be warm. Next time I make this I'll have to try larger needles to compensate for how tight I knit.